Fatehpur Sikri (Hindi: फतेहपूर सिकरी, Urdu: فتحپور سیکری), a city and a municipal board in Agra district in the state of Uttar Pradesh, India, served as capital of India's Mughal Empire under Akbar's reign, from 1571 until 1585. Located in Uttar Pradesh, Akbar abandoned the city, ostensibly due to lack of water. Built by Mughal emperor Akbar in honor of Sufi saint Salim Chishti in 1571, the fort situates at 27° 05' N latitude and 77° 39' E longitude, at a mean altitude of 708 meters above sea level. 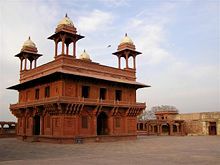 Fatehpur Sikri shared its imperial duties as a capital city with Agra, where the Red Fort safeguarded a bulk of the arsenal, treasure hoards, and other reserves. During a crisis, the court, harem, and treasury could be removed to Agra, only twenty six miles away, less than a day's march. Mughal Emperor Akbar had a penchant for displaying his values and thought through architecture. He stands as one of the greatest Mughal leaders in India, reigning during the sixteenth century. Akbar built the city of Fatehpur Sikri in a barren land, a land known for a lack of water, for one simple reason. He intended to show his reverence for the Sufi saint Salim Chishti. Akbar built the grand city, which proved functional for only fourteen years from 1571 to 1585, surrounding the camp of Salim Chishti. Salim lived in the desert, so Akbar built his city in the desert. When Salim Chishti passed away, Akbar constructed the center piece of Fatehpur Sikri, the Tomb of Salim Chishti. The Sufi holy man's tomb has remained a place of pilgrimage for Muslims into the present day. The tomb of Chishti has especially been attractive to women praying for a son. Beyond that, Chishti's reputation for miracles has attracted Muslims who believe he can still perform any miracle or request. The audience chambers, with the Anup Talao to the left. The legendary Tansen performed from this island. Innovations in land revenue, coinage, military organization, and provincial administration emerged during the Fatehpur Sikri years. Regarded as Emperor Akbar's crowning architectural legacy, its numerous palaces, halls, and masjids satisfied his creative and aesthetic impulses, typical of Mughals. UNESCO designated Fatehpur Sikri a World Heritage Site. Some contemporary Indian architects, notably B.V. Doshi, have cited it as an important source of inspiration. Architect or layperson, the city generally captures the imagination and wonder of all who experience its urban spaces and see its buildings. Charles and Ray Eames, cited Fatehpur Sikri in the landmark India Report that led to the conception of the National Institute of Design, India's premiere design school. The legends of Akbar and his famed courtiers, the "nine jewels," or navaratnas, had originated in Fatehpur Sikri. The legendary musician Tansen performed on an island in the middle of the tank Anup Talao (literally, anup= without metaphor, unmatched). Eventually, legend records that water sources dried up and Akbar abandoned the fort. The architect planned the layout of the city with an intention to use open spaces to highlight the richness of the structures. The way shifts in axes occur as a person moves through the city, and the location of squares in important places with buildings forming a backdrop or envelope, provide an example of the integration of space and structure. Unlike other important Mughal cities (such as Shahjahanabad, which has a very formal planning), Fatehpur Sikri has aspects of informality and improvisation. Indeed, the newly constructed city bore a similarity to the temporary imperial encampment, also designed by Akbar. The buildings of Fatehpur Sikri show a synthesis of various regional schools of architectural craftsmanship, such as Gujarati and Bengali. Indigenous craftsmen from various regions had been recruited for the construction of the buildings. Influences from Hindu and Jain architecture display hand in hand with Islamic elements. Builders predominately used red sandstone, quarried from the same rocky outcrop on it sat upon. Among the buildings, three stand out: Panch Mahal, Buland Darwaza, and the Tomb of Salim Chisti. Panch Mahal Fatehpur Sikri, a five-storied palatial structure, has 176 intricately carved columns on the bottom floor. Also known as "Badgir," which means "wind catcher or tower," Panch Mahal stands close to the Zeenana quarters or Harem, serving as a pleasure palace. An extraordinary structure, entirely columnar, Panch Mahal consists of four stories of decreasing size, positioned asymmetrically upon a ground floor. The pillars that originally had Jaalis between them support the whole structure. Once, those screens provided purdah (cover) to queens and princess on the top terraces enjoying the cool breezes and watching splendid views of Sikri fortifications and the town nestling at the foot of the ridge. The pavilion gives a majestic view of the fort that lays on its left. 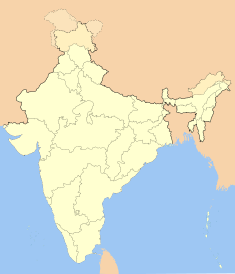 Akbar built the entire city in ten years. Buland Darwaza seen in the evening sunset. 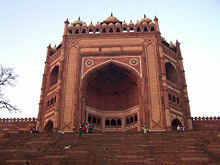 Buland Darwaza, the "Gate of Magnificence" (Hindi: भुलन्द् दरवज़ा), constitutes one of the gateways to the Jami Masjid, a stupendous piece of architecture from the outside, gradually making a transition to a human scale in the inside. Built by Akbar in 1602 to commemorate his conquest of Gujarat, forty two steps approach the gateway. The Buland Darwaza stands 53.63m high and 35 meters wide. Buland Darwaza, the highest gateway in the world, provides an astounding example of the Mughal architecture. Built of red sandstone, inlaid with white marble, the words of Jesus advising his followers not to consider this world as their permanent home had been etched on the monument. The Buland Darwaza towers above the courtyard of the mosque. Semi octagonal in plan, pillars and chhatris top the structure. It echoes early Mughal design with simple ornamentation, carved verses from the Koran and towering arches. Thirteen smaller domed kiosks on the roof, stylized battlement and small turrets and inlay work of white and black marble, grace the structure. On the outside, a long flight of steps sweeps down the hill giving the gateway additional height. A Persian inscription on eastern archway of the Buland Darwaza records Akbar's conquest over Deccan in 1601 C.E. Shaikh Salim Chisti (1478-1572) (Urdu: شيخ سلیم چشتی ) had been Sufi saint of the Chishti Order during Mughal Empire empire. 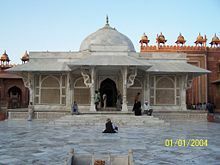 Salim Chisti had been the descendant of the famous Khawaja Moinuddin Chishti whose tomb had been built in Ajmer, Rajasthan. Salim Chisti, a greatly revered Sufi Mystic, reportedly performed miracles. The Mughal Emperor Akbar-e-Azam came to the holy man's camp, deep in the desert, seeking a male heir to his throne. Salim Chisti blessed Akbar, and soon his wife gave birth to the first of three sons. He named his first son Salim (later emperor Jahangir) in honor of Salim Chisti. Akbar held the Sufi in such high regard that he had Fatehpur Sikri built around the Sufi Saint's camp. His Mughal Court and Courtiers relocated there. The city still sits in remarkably good condition as a, mostly, deserted city, one of the main tourist attractions of India. Another view of Salim Chishti Shrine. The tomb of Shaikh Salim had been built with red sand stone but later converted into a beautiful marble mausoleum. Currently his descendant, Khursheed Aleem Chishti, lives there maintaining the Mazar. Salim Chisti's Mazar (tomb), a white marble encased tomb within the Jama mosque's courtyard, sits in the middle of the Emperor's Courtyard. Childless women, particularly those without a male heir, still continue to pray on bended knees before his tomb, believing a special blessing of child birth will come to them. Legends hold that those who offer prayers at that Mazar will received what they request, fulfilled by the will of Salim Chisti himself. A ritual of tying a thread at the marble windows of the Dargah will fulfill the wishes as well. Many threads have been tied there at all times. The ancestral house of Shaikh Salim Chisti lies behind the first building built in Fatehpur Sikri known as "Sangtarash mosque" or Stone Cutter's mosque. Stone Cutter's mosque sits to the west of the Jami Masjid, build by the local stone cutters in honor of Salim Chisti. The mosque integrates beautiful architectural designs of indigenous architectural styles. Salim Chisti spend much of his time in the mosque between hajjs he performed. Salim Chishti's Mazar represents one of the finest examples of Mughal architecture. Flanked by the impressive gate Buland Darwaza, or "Victory gate," on the southern side and Badshahi Darwaza, or Emperors gate, on eastern side. The grand mosque Jama masjid stands on the western side with courtyards, reflecting pool and other tombs. The construction of the mosque began in 1571, the work and completed in 1586, fifteen years later. Naubat Khana—Drum house: Near the entry, where heralds announce important arrivals. Diwan-i-Am—Hall of Public Audience: A building typology found in many Mughal cities where the ruler meets the general public. The pavilion has the shape of a multi-bayed rectangular structure fronting a large open space. Diwan-i-Khas—Hall of Private Audience: Famous for its central pillar with thirty-six voluted brackets supporting a circular platform for Akbar. Raja Birbal's house: The house of Akbar's favourite minister, a Hindu. The horizontal sloping sunshades or chajjas and the brackets which support them make up the notable features of the building. Jodhabai's palace: The building shows Gujarati influence, built around a courtyard with special care taken to ensure privacy. Pachisi Court: A square marked out as a large sized board game (modern day Ludo) where live coins-people- participated. Char Chaman Tank: A tank with a central platform and four bridges leading up to it. Jama Masjid: The mosque, built in the manner of Indian mosques, with liwans (aisles) around a central courtyard. The row of chhatris (small domed pavilions) over the sanctuary represents a distinguishing feature. As of 2001 India census, Fatehpur Sikri had a population of 28,754. Males constitute 53 percent of the population and females 47 percent. Fatehpur Sikri has an average literacy rate of 46 percent, lower than the national average of 59.5 percent: Male literacy is 57 percent, and female literacy is 34 percent. In Fatehpur Sikri, 19 percent of the population is under six years of age. ↑ Charles and Ray Eames, The India Report (Ahmedabad: National Institute of Design, 1997). Bahn, Paul G. 1999. Lost Cities. New York: Welcome Rain. Eames, Charles, and Ray Eames. 1997. The India Report, April 1958. Ahmedabad: National Institute of Design. Gaur, R.C. 2000. Excavations at Fatehpur Sikri: A National Project. New Delhi: Aryan Books International. ISBN 9788173051784. Nath, R., and R. Nath. 1988. Architecture of Fatehpur Sikri: Forms, Techniques & Concepts. Jaipur, India: Historical Research Documentation Programme. ISBN 9788185105093. Petruccioli, Attilio, and Thomas Dix. 1992. Fatehpur Sikri. Berlin: Ernst & Sohn. ISBN 9783433027059. Sharma, D. V. 2008. Archaeology of Fatehpur Sikri: New Discoveries. New Delhi: Aryan Books International. ISBN 9788173053221. Fatehpur Sikri in UNESCO List. Photographs of Fatehpur Sikri by Benoy K Behl. Pictures of Fatehpur Sikri. From a backpackers trip around India in 2005. Pictures of Fatehpur Sikri - Terra Galleria.